A simple levator scapulae stretch won’t do much to ease that pain in your neck. Instead, it’s time to understand the root causes so you can recover effectively. Your levator scapulae is not a massive muscle, but it can have a big effect on your pain and function. This muscle originates at the first four cervical vertebrae of your neck and inserts into the upper corner of your scapula, called the superior angle. Its primary function is to elevate your scapulae (hence the name), when the spine is fixed. This motion is common in activities like swimming, racquet sports like tennis or squash and throwing a baseball or football. It also assists in pulling your shoulder blades toward the midline with a slight downward rotation and anterior tilt of the scapulae . If you’ve got a common postural problem called forward head posture, this anterior tilt of the scapulae can become exaggerated. We’ll dive more into forward head posture later, but this is a good thing to keep in mind. When your scapulae are fixed the levator scapulae assist in side bending and rotation of your cervical spine. Lugging around heavy bags over your shoulder, sleeping with improper support, and a big one – POOR POSTURE – can all also contribute to pain in this muscle. Levator scapulae pain is commonly felt as trigger points in the neck, but it also causes restricted movement and for some folks it can even cause some pretty nasty headaches. Referred pain from the levator is another common problem. In these cases you might feel discomfort down the shoulder or on top of the scapulae. 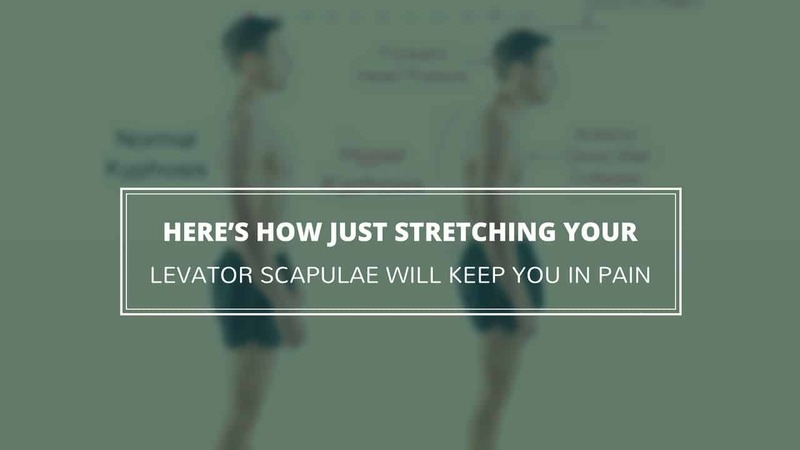 If you have symptoms like chronic headaches, shoulder pain, neck pain or trigger points, you can perform a few quick mobility tests to see if a tight levator scapulae might be contributing to the problem. Remember that when your shoulder blades are stable, contractions of this muscle can lead to side bending and rotation of the neck. We’ll use thee motions to see if your levator scap has the range it should have. Standing up straight, side bend your neck, taking your ear towards your shoulder. You should be able to get to about 45 degrees of motion. Next try to keep your shoulders stable, but rotate your head toward the side. Here you should get to about 90 degrees, seeing straight out to the side. If either of these movements are limited it’s a sign you probably have very tight levator scap muscles. How Do You Stretch the Levator Scapulae? Faced with these tight levator scapulae symptoms, most folks will try a classic levator scapulae stretch. In this stretch, you sit on a chair or bench and take your chin down towards one shoulder – let’s say your left. You then use your left hand on top of your head to encourage your chin down, while using your right hand to grab the chair behind you and resist. This stretches the right levator scapulae. It doesn’t do anything at all to address the root causes of WHY you have levator scapulae pain. So while it might temporarily provide a little extra length to the muscle, it’s simply going to tighten right back up. I don’t recommend you take this route. Instead, let’s do things to make a lasting change. There are 3 major causes behind levator scapulae pain. We’ll dive into each one, and I’ll give you the best ways to address each. Forward head posture has become a huge problem. Thanks in part to all the time we spend hunched over our phones or computers, this improper positioning of our head and neck has become extremely common, and with it, levator scap pain. Forward head posture contributes to levator scapulae pain because when you hold your head in this way, it requires constant firing of your levator scaps – muscles that are not designed to be a postural, long-firing muscle. When these muscles are forced into over use, they become chronically tight and painful symptoms like trigger points and headaches develop. And, remember that forward head posture changes the line of action of your scaps, exaggerating the anterior tilt of your shoulder blade. This can cause a whole new set of alignment issues and muscular imbalances. To fight this, there are a couple of great, simple strategies. This move will help stretch the deep cervical extensors that are often at the root of forward head posture. These muscles are creating the posture that’s sending the levator scaps into overdrive by pulling the head down and the neck into extension. This chin tuck stretch will provide length to these muscles and help them start to release some of that excessive tension. Now that we’ve worked on releasing the overactive muscles behind forward head posture, we’ve got to strengthen the muscles that will help you maintain a neutral neck position. The final strategy for fighting forward head posture is simple – awareness. As you move throughout your day, try to be aware of your posture and correct it. Notice if your head is pushing forward as you are typing, or texting, or just standing in line at the grocery store. Thumb pain also is commonly associated with forward head posture due to the amount of time we spend on our devices, so if you’re experiencing thumb pain from texting or typing head over to this article. Building a habit of awareness and self-correction will help you reduce forward head posture and the levator scap pain it can cause. The second major root cause behind levator scapulae pain is very closely related to forward head posture – thoracic kyphosis. Thoracic kyphosis is an excessive rounding in the upper back (i.e., creating a hunch back posture). Thoracic kyphosis and forward head typically go hand in hand, appearing together and both creating excess tension and tightness in the levator scap. To correct this region of the spine, there are a couple of different techniques to try. This is a simple joint mobilization technique which will help encourage mobility of your upper back. Yet again, we’ve got to follow up a mobilization strategy with one that will activate the muscles that should be firing in order to create lasting effects. Executing this move requires concentrating on activating the muscles properly. Try to really focus on firing up your extensors – it should get easier to do so over time. The final common root cause of levator scap neck pain is dysfunctional scapular movement. This issue usually presents itself in upward rotation of the scaps, which is required to fully lift your arms up overhead. If the muscles that are supposed to support this motion (mostly your trapezius and serratus anterior muscles) aren’t firing correctly, your levator scap will step in and compensate in the elevating of your scaps. Yet again, this is not the intended function of your scaps and will lead to chronic tightness and tension. This is a common problem and there are a lot of strategies you can use to address it. I have an entire article devoted to scapulohumeral rhythm and scapular dyskinesis (or the dysfunctional movement of the scapulae). While the first two problems are relatively simple to fix, scapular dyskinesis is more involved and to that end I suggest you watch this presentation that explains the issue in-depth and the path to addressing it for good.